See epic battles and Indian dances. Experience the sorrow and heartbreak of tragedy and loss. Witness the pageantry of the Queen and her court and celebrate the birth of Virginia Dare, the first English child born in America. There is music, laughter, romance and dance. Over 130 actors, technicians, designers and volunteers gather each spring to begin rehearsals to bring The Lost Colony to life for another summer season. The production is enormous. The stage itself is over three times larger than most Broadway stages in New York City. You will be seated in the center of the action with the show happening on three sides of you and even sometimes right next to you in the aisle. The Lost Colony outdoor drama is the “grandfather” of all outdoor dramas and is produced by the Roanoke Island Historical Association (RIHA), a non-profit whose mission is to celebrate the history of the first English colonies on Roanoke Island, North Carolina, and to honor the founders of The Lost Colony symphonic drama through drama, education, and literature. 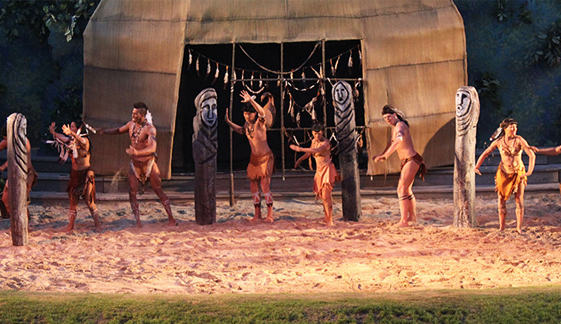 First staged in 1937, The Lost Colony is the nation’s premier and longest-running outdoor symphonic drama. Written by Pulitzer Prize-winning playwright Paul Green, The Lost Colony’s 80th anniversary season opens May 26 and plays through Aug. 19, 2017 at Manteo’s Waterside Theatre, on North Carolina’s Outer Banks. Arrival: As the finest outdoor theater NC has to offer, you should plan on arriving one half hour prior to your first scheduled event. For example if you’re doing the backstage tour at 6:30, arrive by 6:00. This gives you plenty of time to park, pick up your tickets, take some pictures, etc. Parking is very close to the box office but there is about a 150 yard walk from the box office into the theatre, so plan accordingly. Length: The performance lasts 2 hours, including a 15 minute intermission. Pre Show: The theatre opens for seating at 7:15, but the rain-shelters are open at 6:00. Restrooms, gift shop and concessions are available. Curtain: The play begins promptly at 7:45. Late arrivals may be held from going to their seats at the discretion of the house manager.